Suited up for his board meetings in a tailor-made suit, accompanied with a tie pin and gourmet food on Fridays. If that’s the man you are trying to please, the Imperial gift box will sure make him smile. Monarch (100 ml) - Subject your senses to some regal resplendence with Monarch- an imperial fragrance accompanied by a woody aromatic signature tone. Gallant (100 ml) - Compliment your sartorial splendor with base tones of Tonka beans and Sandalwood. Be the cynosure of all eyes with Gallant. Rembrandt (100 ml) - Revel in the exuberance of Rembrandt- a heady mix of the choicest citrus flavors which should do the right amount of justice to your style and persona. Additional Information: For the gentleman in you. 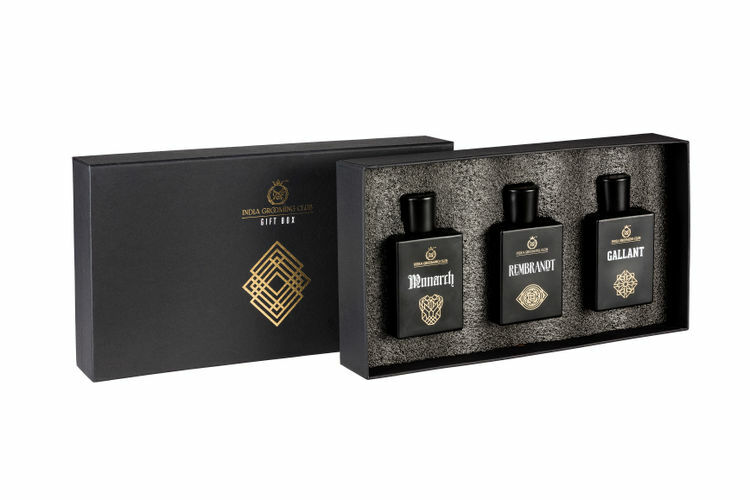 Indian Grooming Club is a leading men’s grooming brand that curates and tests each of its products individually before putting out in the market. They are known for their high-quality grooming essentials such as shaving care, skin, bath and body products that make daily mundane tasks a luxurious affair.